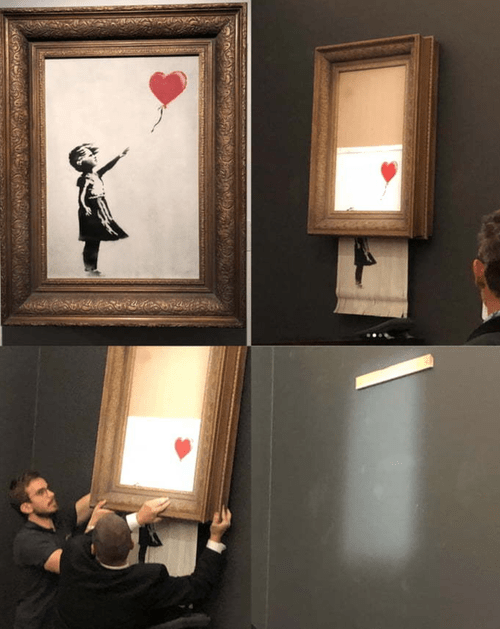 A Banksy painting “self-destructed” Friday evening on the auction podium at Sotheby’s New Bond Street location in London after being sold for 1.04 million pounds. The spray-painted canvas “Girl With Balloon” was subjected to furious bidding at the Contemporary Art Evening Sale with a winning bid by telephone, fetching more than three times its pre-sale estimate and a record price for the mysterious artist. Shortly after the auction was concluded, an alarm from within the painting sounded, with most of the artwork emerging from the bottom in strips. Hidden within the base of the frame was a shredder. “We’ve just been Banksy’ed,” Alex Branczik, Sotheby’s European head of contemporary art, said at a press conference after the auction. “We have not experienced this situation in the past . . . where a painting spontaneously shredded, upon achieving a [near-]record for the artist. We are busily figuring out what this means in an auction context,” he said.